Monster.com is searching for a new lead creative agency amid its split with BBDO, which has handled the brand since 2007. The Weston, Mass.-based job listings site is working with Boston's Pile + Co. on the search. Representatives at BBDO and Monster said the decision to part was mutual. Sources believe that Monster, which also works with agencies like 360i and Brand Content, may consolidate all of its business with one lead shop as a result of the review – speculation dismissed by a Monster rep. When BBDO won the global Monster.com business eight years ago, the site spent $155 million in measured media, according to TNS Media Intelligence, although overseas spending was thought to increase that amount to over $200 million. As Monster.com faced new online competition from LinkedIn, Salesforce and aggregators' listings, the site began cutting back on that media-driven image building in favor of online efforts. Last year Monster.com spent only $15 million on measured media, according to Kantar Media. 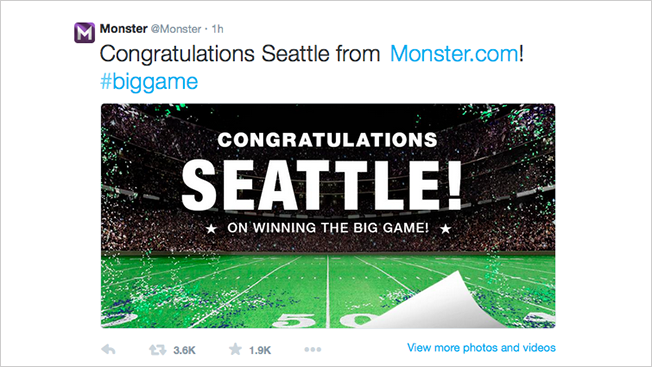 In going up against new competitors, Monster.com is using data analysis and social-ad targeting as it launches new recruiter tools like Monster Social Job Ads, Monster Twitter Cards and TalentBin by Monster. Last month the company said the site's bookings have gained momentum as it posted a 6 percent gain, year over year, in Monster's core North American careers segment. But while page views in May increased 36 percent over the year-earlier month, the number of unique visitors to Monster.com slid 29 percent to 11.2 million.